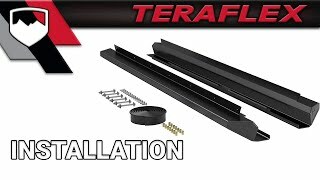 The TeraFlex JKU 4-Door Aluminum Rock Slider Kit protects the lower side of your JKU Wrangler Unlimited. • Also available w/ a raw finish (# 4937310). These rock sliders are awesome. They look great on the Jeep, good lines with the body, and compliment the Teraflex front and rear bumper that I had purchased. I was a little nervous about having to drill into the body but as long as you take your time and don't rush it you shouldn't have any issues. Just remember the metal on the Jeep body is pretty thin. Also drilling the holes for the bottom mounting brackets I found it easier just to use a longer drill bit so I could just go through both layers of metal instead of drilling below and then going into the cab to drill down.